Is it time for new shocks and struts in your vehicle or is it something else? Do you need new Shocks and Struts? 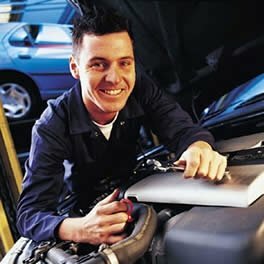 Are you hearing a clunking noise while going over bumps? Maybe you feel like your car is floating down the road or bouncing up and down after every bump. These could be signs that your vehicle’s shocks and struts are worn and need replacing. Shocks and struts can get overlooked when it comes to doing the normal maintenance required to keep your vehicle safe and operating properly. 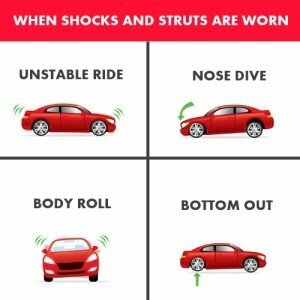 What most people don’t realize is how important shocks and struts are in keeping your vehicle safe. Some sure signs that you may need new shocks or struts on your car, truck or SUV. As they wear they also decrease their ability to resist wheel and body movement which can make it more difficult to control your vehicle. This can become evident by increasing the stopping distance of the vehicle under hard braking conditions, as the nose of the vehicle may dip down or the body may tend to roll. The tires can also lose contact with the road because the sudden up and down movements of the springs are no longer dampened by the shock absorbers. This rapid loss of traction between the tires and the road can also lead to premature tire wear in the form of cupped tires. Should your tires become cupped they would need to be replaced. Worn shocks and struts can also cause wear on other vehicle components such as coil springs, ball joints and control arms, which can cause more costly repair bills down the road. The reason is that a worn strut or shock absorber will allow more up and down movement of all of your suspension components. The more up and down movements that occur, the more wear and tear on those components occurs. A Bad Suspension Puts You and Your Passengers at Risk! Tie Rod – Tie rods are part of your steering system and when going bad will usually create a knocking noise and make your steering feel a little sloppy when turning side to side. Sway bar – This part of your suspension links the left and right side of your car and helps keep your vehicle stable when turning fast or driving on bad roads. Control Arm Replacement The control arm connects the front suspension to the frame of the car. If the control arm is bent or the bushings are worn, replacement of the control arm assembly may be necessary. Stabilizer Link – If you are hearing a loud clunk when riding over a bump this may be the culprit. Shock Absorbers– this is the most common cause of that bouncy feeling while driving and bad shocks can easily become a safety issue. Struts – Supporting and stabilizing the frame and body of your vehicle is the job of your struts. It is important to check these if your car feels unstable or you feel that you are losing control over your vehicle. If you feel like your vehicle may need repair of the struts or shocks or want a complete suspension inspection, All-Out Diesel & Transmission can help. We have the knowledge and experience to determine if what you are feeling is actually an issue with your shocks or struts or maybe something else. We deal with major strut brands such as KYB and Monroe and in most cases can perform the repairs and get you back on the road in the same day. At All-Out Diesel & Transmission in Conroe, Texas, just minutes from Spring and Tomball, Texas. 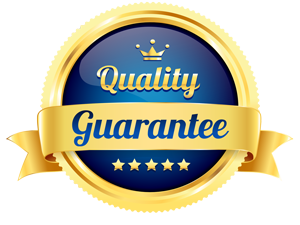 we have the most current suspension diagnostic equipment to service shocks struts and other suspension issues on domestic and foreign cars, trucks and SUVs. What types of Makes do we service at All-Out Diesel & Transmission? Suspension Repair and service on domestic automobiles include Chevrolet, Ford, Chrysler, GMC, Dodge, Jeep, Pontiac, Cadillac, Saturn, Corvette as well as high performance vehicles.